A pool table dining top is a two-for-one deal. Now you don't have to argue with your spouse or children over a recreation room versus a dining room. Pool tables require enough space to properly shoot, and your dining room may be too small. Pool tables are a few inches higher than the typical dining table, so you may have to purchase special chairs. You may need storage space for the tabletop when the pool table is in use, depending on its construction. You will also need storage space for the dining chairs when not in use. If you don't own a pool table yet and have plenty of money to spend, purchase a dining and pool table in one. They are available in a variety of elegant, traditional or streamlined modern designs. Your dinner party guests would have no clue that your beautiful dining table can multitask as a pool table! Many models incorporate swivel tops so conversion is a snap and you don't have to worry about lifting a heavy tabletop or finding a place to store it. 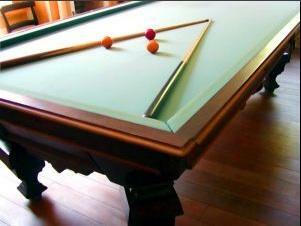 A more budget friendly option, especially if you already own a pool table, is to buy a conversion dining top. Check with your pool table's manufacturer as many sell these tops to coordinate with the tables, or measure your pool table and find one that is a match. For those who are handy with tools, another option is to make your own dining top for an existing pool table. Begin by carefully measuring your pool table. A lightweight and inexpensive option is to cut Styrofoam to fit and face it with wood veneer. You may also use veneered plywood with some edging to create a finished look. Consider making the tabletop in two pieces so it is easier to remove and store.